A few times a week, I get submissions from artists and bands who are wondering if we’d be interested in writing about their music. I appreciate these submissions and feel honored bands approach us with their work to see what we think. I always think it’s ridiculous people care about our opinion, even if offering said viewpoint is the whole reason this site exists in the first place. We can’t get to everything, and really, not everything we receive fits. But now and again something will come along that totally aligns with the type of music we love and try to feature on this site. That happened recently when the band Askrinn sent us a message along with their debut offering “Hjørleifsljóð.” The message was accompanied by a brief description of the music, basically in that is in the vein of Arckanum, and that made me want to tear into the thing for two reasons. First, anything compared to Arckanum gets my ears to perk up because I love that band. Second, I wanted to see if that line of thinking applied and if it measured up to those expectations. Luckily, it did, and if anything, band mastermind Valenten may have sold his project short, because his reaches go far beyond. The music is rooted in Pagan black metal, something in which I indulge heavily in late fall and winter months, because to me, it just works so well at that time of the year. Cold weather oppressing, red and orange skies mixing with purple as dusk nears, and my boots crunching snow, dead branches, and decaying leaves. Lyrically the record is inspired by a 13th century Icelandic text. But beyond that Arckanum comparison, I hear so many more influences in Askrinn’s music, stretching but not limited to early Enslaved, Leviathan, Beherit, and Summoning, groups that do a great job balancing atmosphere with outright brutality. So the music that greeted me on “Hjørleifsljóð” excited me so much, I felt that not only did I want to render my opinion, but I wanted as many people as possible to check out the music and see if it doesn’t make their blood surge. The first cut “Bjarmalandsför Hjörleifs konungs” rips open, with a wintry black metal-style guitar assault blasting fully and compelling melodies encircling and enrapturing you. The song takes some bizarre turns, leaving you unable to look back and see a clear path as to where you’ve come from, and the wrenching vocals work with the twisting and spiraling chaos to mete out devastation. Toward the end of the track, folk-inflected guitars rise up and the track bursts to its finish. “Hjörleifr mægðist við Hreiðar konung” follows, beginning with acoustic strains drizzling down and fury finally taking hold of the song. Once again, the vocals are fierce and emotional, matching the intensity of the music that just crushes in spots, and there’s a charm apparent in the lo-fi approach to the cut. It feels genuine and raw, which enhances the atmosphere. Valenten again delves into folk, letting in some color and more texture, but before it’s over, the fires blaze again, the melodies are inventive and invigorating, and the final moments feel like they emanate from a deep freeze. “Frá spám Marmennils” has a doom-infested intro, making for some of the darkest pockets on the record, but eventually Valenten returns to churning out spacious black metal, with the leads raining down hard and delivering total darkness. There is some cool start-stop playing that makes the music feel chunky and heavy, though eventually some echoey acoustics bleed in to halt the pace. Once the storm returns, the vocals take on a creaky, terrifying tone, the leads feel like they’re racing over a bumpy road with reckless abandon, and speedy melodies and guttural growls keep punishing you to the end. “Frá konungum, Hjörleifi ok Hreiðari” has an elegant introduction, with clean playing leading the way, and more serenity that hopes to disarm you for when the power strikes. And it does, with razor-sharp, dangerous guitars, shrieks floating atop the madness, and a great tempo that gets your fists clenched. The drums are utterly assaulted, the fever builds, and the song has a great finale that should leave your lungs gasping for freezing air. Valenten ends the record with an excellent cover of Bornholm’s “Hymn to the Forgotten Pagan Gods,” his take on the Hungarian band’s song that’s a little grislier than the original. It fits really well with the four original songs, and it brings this collection to a thunderous, satisfying end. 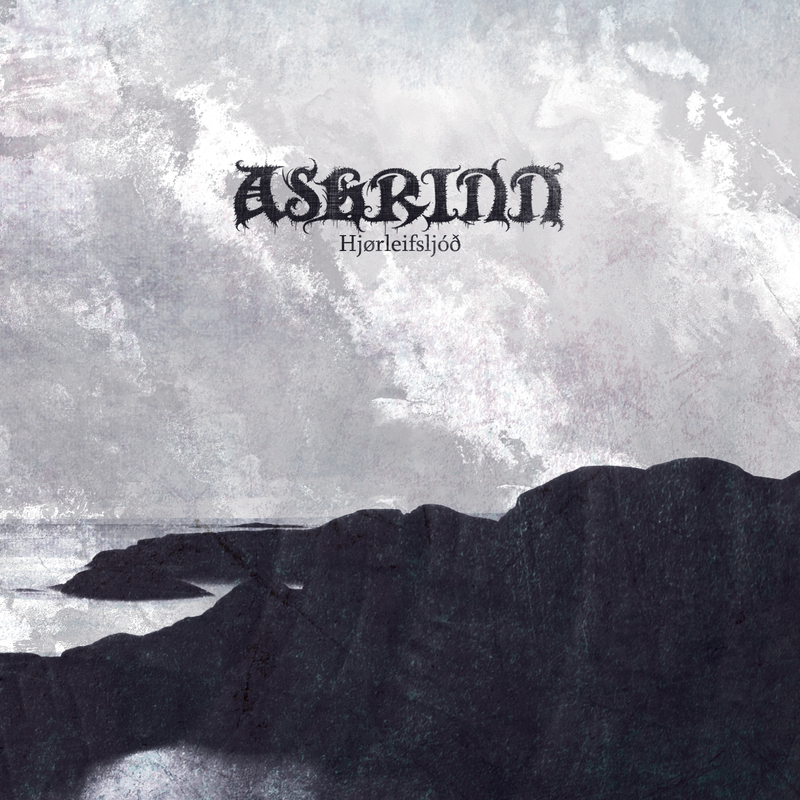 Askrinn is a very worthy project, one that’s just in its infancy and really has a world of potential to explore. Valenten has done a great job with “Hjørleifsljóð” to keep it heavy but raw, fully realized but open to the listeners’ interpretation of the journey. I’m hoping to see Askrinn grow and develop from here, as the ideas behind the band and the fantastic music make for solid foundations. I’m thrilled Valenten chose to reach out, because this adds more vital music to my icy soundtrack over the next few months. This entry was tagged Arckanum, Askrinn, Hjørleifsljóð, Pagan black metal, Valenten, winter. Bookmark the permalink. Thank you very much for this in-depth and truly interesting review ! Thanks for the music. Take care.